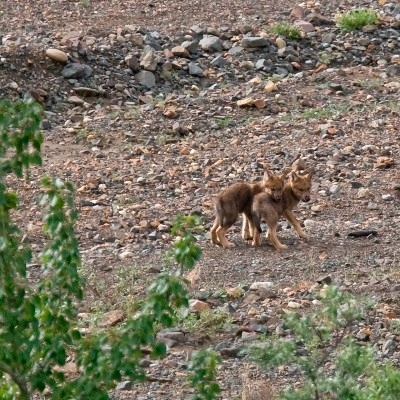 Wolf pups are born in late spring and early summer in Denali National Park in Alaska. No better time than retirement to take in our national parks at the leisurely pace they deserve. At age 62, Americans can purchase a $10 park pass that is a life-time ticket to the magnificence of Glacier National Park, bison calves grazing with their mothers at Yellowstone, or peregrine falcons nesting at Acadia. But get the pass soon, though, because AARP reports the price will increase to $80. Many people don’t learn the pass exists until they visit a national park where a ranger might or might not offer one. The passes, which are issued by the National Park Service, include free access to the holder, a spouse and others riding in their car. The pass sometimes includes discounts of 50 percent at camping facilities. It’s possible to purchase the life passes online for $20. The Park Service advises travelers planning a trip to contact a park in advance to make sure the $10 passes are available for purchase at that specific location. While it’s generally not wise to claim your Social Security at 62, it’d be silly not to take advantage of this federal benefit. This is easily one of the best deals out there – I had no idea it was only $10 at a park! Thanks Kim — I just took advantage of this neat rate. Now…if only I enjoyed the National Parks and actually go VISIT one, I’d easily recoup my small fee of $20, while helping out nature and the parks system. Let’s hope I get off my dusty-rusty and visit with Bambi and Co.! This is a terrible policy, one I’m glad is changing. Retirees who visit the parks undoubtedly tend to have much higher incomes/wealth/resources than a) other retirees who do not visit them, and b) working age adults. The parks are becoming overcrowded (Google news articles on that), so why is one person’s visit subsidized by others and by the negative externality of overcrowding? A retiree with an RV worth tens of thousands of dollars pays $10 for life? I am fine with subsidizing retirees, let’s just do it in a way that is targeted to people most in need. This is not the way to do that.